Just recently noticed this porblem with my 88 240. The trunk won't unlock electronically, but I can unlock it with a key. I've been reading it's probably needing a cleaning. Can anyone confirm, and if so, what needs to be cleaned? If the trunk opens with the key, what makes you think the lock needs to be cleaned to work? - blown fuse (I have no confidence that the trunk motor shares a fuse with the central locking - check the fuse panel legend). Could also be a loose mechanical linkage (you should hear noise indicating this when someone tries the electric unlock function for you) or even a dead lock motor. If it's mainly a cold weather issue, yes, a cleaning and lube. The actuator is probably OK because unlike the passenger door actuators, this one is well protected from water. I suggest removing the latch to get at the lock. Remove the lock if you want to do a thorough job, but others have reported success by just shooting spray lube at the rotating part of the lock. 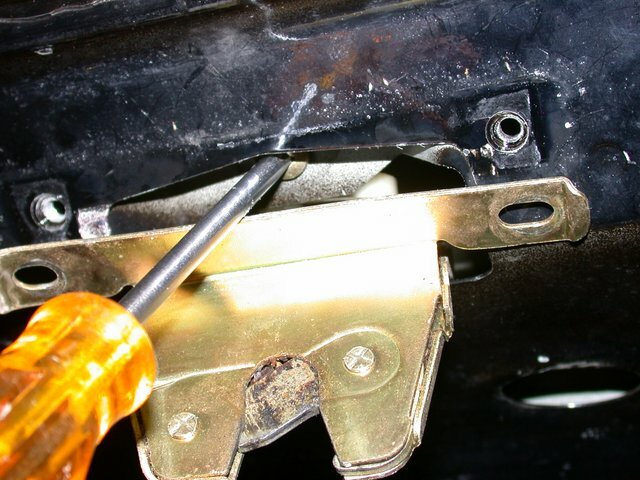 To remove the lock, disconnect the actuator rod by prying it away from the lock. It snaps in. This is all good info and I have done this before in the past when the key won't open the trunk. I suspect a wiring fault. It is a common issue when it gets cold. No wiring faults. The actuator is marginally powerful enough to operate the lock when clean and new. It is a common issue when it gets cold. Just as I can't rule out wiring, or half a dozen other possibilities that accumulate to unseen 30-year-old cars having multiple owners. But our OP will understand what you say about listening to hear whether the actuator is even trying to work the lock (it grunts a bit). It is damned cold up here, and if you're still in Birmingham, I'm envious. But we're not complaining around folks from Calgary and Minnesota. And maybe if the clean'n'lube doesn't help he will check the voltage drop to the blue/yellow pair at the connector where the actuator plugs in under the deck lid. It is all in parallel with the other three doors (four in our cars with the remotes) so on the same fuse #8 always. 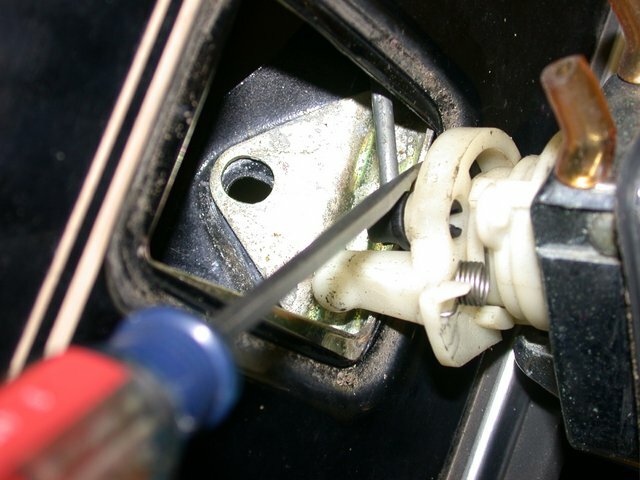 Faulty wiring (broken strands inside petrified insulation) is often the reason the other doors may not work from central locking because those wires need to pass through a sharp bend in the door jamb conduit, compared with the well-protected large radius sweep at the deck lid hinge. Then again, if a person stores his tools in the trunk, that hinge could get more action than the doors. The cold weather problem is likely....OP is in the northeast. Mine will work in the cold when the car is running (higher voltage) but tends not to work when the engine isn't running (slightly lower voltage). Alternatively, I may have to yank up on the knob on the drivers door a few times consecutively to get the trunk to unlock via the actuator after I've shut off the engine. Dumb question: Did the 240s have the dual position locks like the 900s and 700s did. One position (vertical?) of the key allows it to unlock with the power lock. Horizontal (turn counter clockwise) locks it and prevents the power locks unlocking it. It's called valet mode or something like that. Yeah, I'm in northern NH. It's been working fine in the spring, summer and fall, but lately I've noticed the door locks and now the trunk are getting sticky in the cold. I'll try and get to this soon, I drive it everyday though so will probably have to wait until the weekend. 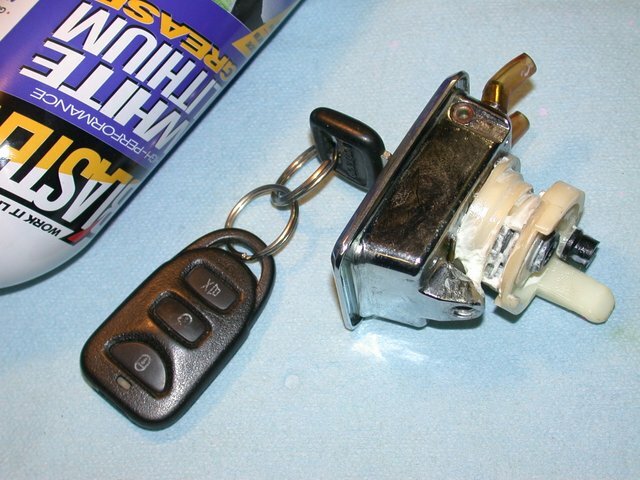 The latch automatically locks when locking the driver's door, just doesn't unlock. I've noticed when turning the trunk key right it springs back to the neutral position, but when turning left, it sticks. So that's what's making me think it's sticky. Hmmmmm.... This has me thinking now. Let me go check this out. Maybe that's why. If you insert the key, turn left (counter-clockwise) and remove the key while it's in the horizontal position, then the trunk will always be locked. That's the valet setting. One look at the lock will tell you, if the slot is horizontal, it's off the power lock circuit. Yep, well call this topic solved. I'm stupid. Had no idea 240s had that. Trunk works now. Hahaha. Still going to clean it though, I'm sure it never has been. Thank you all for your input. Reminds me of my embarrassment shortly after taking delivery of our first 86-93 sedan. The PO, a dentist, and his wife delivered the '90 (using his tags) and as they began to drive away in their new C30, I ran after them to ask if they perhaps had a trunk key. I was trying to open it with the valet key. I've known about this so long (since '91), I don't even think of it. It's so bad, I didn't even bother telling my son about it until he complained about his '92 940T trunk not unlocking a couple of months ago.